I just installed WindowsServer 2008 and when it asked me to select the password for the admin login, I wasnâ€™t able to choose a password that it would accept. There was no option to explain the minimum requirements, so I searched on the Internet and found Microsoftâ€™s Domain Policy Settings which explain this. A password cannot have the userâ€™s account name or use parts of their full name with more than two sequential characters. Minimum password length is 6 characters. Uppercase letters (A to Z). Lowercase letters (a to z). Characters other than letters or numbers (i.e. !, $, #, %). There are 2 ways to find the Mac address in a Windows XP computer. 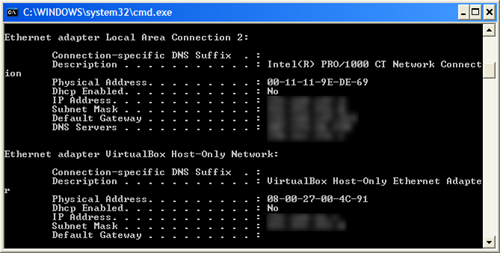 The easiest way is to use the command shell and another option is available through the control panel. Open the command shell (click on Start, select Run, type cmd and press OK). You can find the Mac address by finding your network adapter (typically its Local Area Connection) where it will be displayed as the Physical Address (see image below). Right click on network adapter used, which is probably Local Area Connections. Select Status, which will open a dialog box. 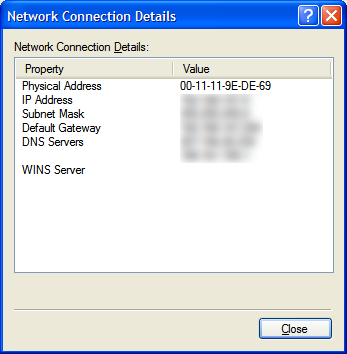 The Network Connection Details dialog box will open and the Mac address is shown as the Physical Address (see image below).